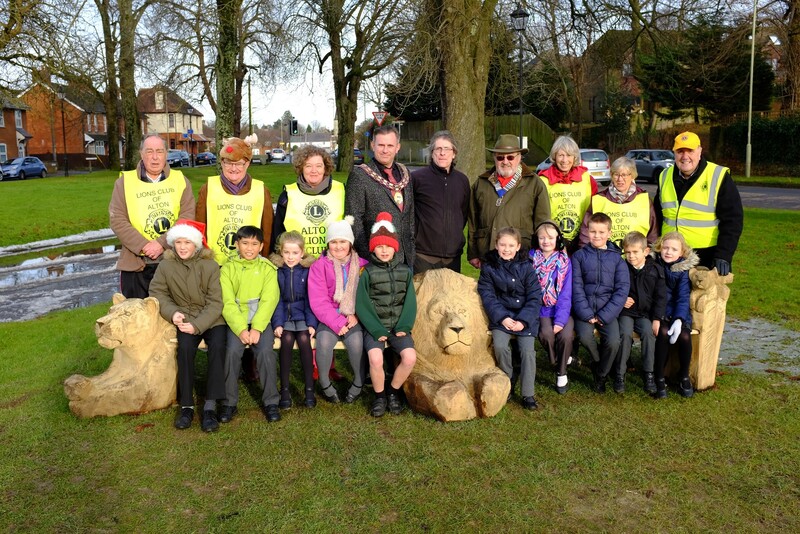 ALTON LIONS commemorated the centenary of Lions Club International in the run-up to Christmas with the installation of a beautifully carved ‘LIONS’ bench at Alton Butts. Located at the town end of the green, the solid English oak bench has a Lion’s head centre piece with a Lioness on one arm and her cubs on the other. The work of local craftsman, Jonathan Cleaver, the bench was officially handed over to Alton Town Council on December 14, by Alton Lions President, Michael Gwynne, and received by Alton Town Mayor, Cllr Dean-Paul Phillips, in a ceremony also attended by a group of delighted children from The Butts Primary School. Lions Clubs International was formed in 1917 by a Chicago business leader, Melvin Jones, who wondered what would happen if people put their talents to work improving their communities. As a result of his inspiration, 1.5 million men and women today are members of the world’s largest community volunteer service club association, based in some 46,000 clubs in over 200 countries and geographic areas. Alton Lions Club was founded in 1972 and in the ensuing years Alton Lions have made a substantial contribution to the local community not only in staging community events to fund raise but also providing inclusive activities for community together experiences. The results of these events and activities enable grants to individuals in need, local charities, schools, organisations and for community events and facilities and also include such activities as ‘Message in a Bottle’, the Christmas gift project, Tea Parties for the Elderly, young people’s projects including ‘Young Leaders in Service’, sports student sponsorship, the children’s day out to Paulton’s Park, and ‘Party in the Park’. One of the most recent projects has been the installation of a ‘Defibrillator’ on the outside of the Assembly Rooms for use in an emergency. It’s easy to meet Alton Lions at events such as the regular Craft Markets or whenever you see them about in their familiar yellow tabards. Or you can visit www.altonlions.org.uk, Facebook, Alton Lions Club – Registered Charity No:1174502 or call 0845 833 2701. Children from Butts School can be seen sitting on the bench with Alton Lions standing at the back. They are (LtoR) Lions Dave Crocker, Mike Baker, Pauline Folkes, Town Mayor Cllr Dean-Paul Phillips, wood sculptor Jonathan Cleaver, Alton Lions President Michael Gwynne, and Lions Margaret Willoughby, Sarah O’Donoghue and Peter Bacon.